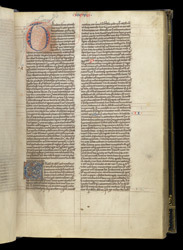 This is a typical mid-13th-century Bible: written in small script in two columns on very fine parchment. This style of 'pocket' Bible was developed in Paris, probably for the use of Dominicans, who needed to have a portable copy of a standardised text. This manuscript has an inscription of circa 1300, stating that it belonged to Brother Gervase of Bangor--presumably a member of the Dominican house there--and that after his death it should be bequeathed to the Franciscan house at Llanfaes, in Anglesey. The start of the Book of Joshua shows us something about the medieval sense of hierarchy: the initial 'T' at the start of the prologue is larger that than the initial 'E' at the start of the main text, but the main text's greater importance is conveyed by the fully-painted technique, rather than its size.